I have been a lover of historical romance since I read my first fairy tale. I've watched romances evolve over the years and believe me they have evolved. Its a subtle difference, but there is a difference. That being said, I really enjoy reading both older romances and newer romances. Recently, I read Allison Knight's historical romance, Heartsong. This book, while published in 2008, reminded me of older romance novels. I think its partly the language, partly the story line, the alpha hero trying to show off his alphaness, the inherent danger to the heroine's life. Desperate and proud, Rhianna ap Brynn Ffrydd, a Welsh princess, is captured by a hated Englishman, Baron Garrett deShay, an agent of Edward I of England. Despite the passion he arouses in her, Rhianna must find a way to return home to her younger half sister, whom she's raised since birth. Garrett, emotionally scarred but intent on gaining the respect of his monarch by surrendering a member of Welsh aristocracy, fights an overwhelming attraction and the need to protect this woman, despite the charge of witch that hangs over her head. Can the two lovers conquer the cruelties awaiting them and their own natural animosity, to accept a forever kind of love? Medieval history is one of my favorite time periods. There is something about the knights, ladies and castles that gets me every time. Even their clothes and food fascinates me. 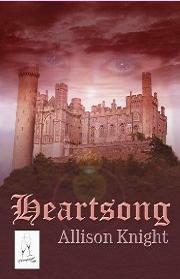 Heartsong, is a medieval historical romance, with the heroine being Welsh and the hero being English. They were born to hate each other. In fact the only reason they met was because he invaded her lands and captured her. *Rubbing hands* I couldn't wait to see how he won her over! Ms. Knight did a good job of capturing the medieval setting, with the castles, fires, furs, servants, laws, witch trials, horses, travel, food, window slits, etc... I was able to put myself into the book and visualize the surroundings. This book took me back to older Julie Garwood medievals and Kathleen Woodiwiss days--yes Ms. Knight, your writing reminds me of these medieval romance Queens! But there were a few things I struggled with. I had trouble with the progression of their romance. I wish the story had been longer so I could see more reasons for her to want to stay then to return to her family. I was a little disappointed with how Garrett treated his sister at first and his betrothed, as well as continuing to call Rhianna "wench". I know this was in keeping with the times, and yes his sister was irritating, but I would have liked to see our hero be a little more heroic. Now, those things aside, I did enjoy it. I would have liked it more if it were a little longer. The last 50 pages really had my eyes peeled open too--lots of action and drama in that last bit. The book did have a satisfying ending. I see after looking on Ms. Knight's website that there is a sequel to this book titled, Battlesong, which released earlier this year. I read the excerpt, and Ms. Knight, it sounds fabulous! I will be adding it to my TBR pile, as this one is Arthur's story, and I'm curious to check on the characters and see how his own romance progresses. Allison, like many authors, read a book she didn't like. Despite occasional digs from her children, she wrote a romance. "Heartsong" is her thirteenth book. A retired teacher, she's taught fiction writing and spoken at conferences throughout the country. She and her husband moved south to the land of hurricanes and sunshine. When she isn't watching the weather, she writes, creating heroes and heroines, then finding ways to make their lives miserable. Lovely review. I've read this story also, and thoroughly enjoyed it. Enjoyed the review, and find the book is already on our Readers.